One of North Carolina's most common household insects is the carpet beetle. There are several species, but the most familiar are the black and the varied carpet beetle. 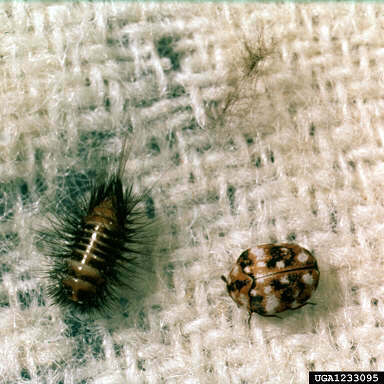 The brown, hairy larvae or cast skins of carpet beetles usually are found in stored woolens, carpeting, lint accumulations, cracks and corners of closets, dresser drawers, and occasionally, in stored food and cupboards. The larvae are quite active and may appear almost anywhere in the house. It is probable that every home has some carpet beetles, although finding just a few is not usually considered a problem. Adult carpet beetles are small, oval, black, and approximately 1/8-inch long. The adult beetles feed on pollen. 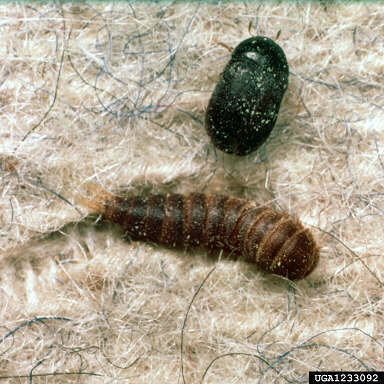 The larvae often feed on lint but can cause serious damage by feeding on animal fibers—wool, fur, feathers, hair, bristles, mohair—in clothing, carpeting, upholstery, and other household furnishings. They do not feed on synthetic fabrics. Carpet beetles can also be pests in dried food products, such as flour, corn meal, cereal, and other similar foods. Housekeeping is important. Regular, thorough removal of lint eliminates insect breeding places. Pay particular attention to rugs, carpets (especially next to walls), upholstered furniture, closets, shelves, radiators (and the space under and behind them), registers and ducts, baseboards, moldings, corners, and floor cracks. Inspect clothing and storage areas in the fall and spring for potential infestations. Also periodically check that windows and air ducts are properly screened to help prevent the entry of insects. Dry clean or launder clothing before storing as carpet beetles are more apt to infest soiled material. Store clothing in tight boxes or chests. It is generally not advisable to use plastic bags. Although they may not harm clothing during short-term storage (several months) long-term storage could result in damage to clothing due to moisture problems or potential reactions between the plastic and the fabric. Place mothballs or crystals (naphthalene) or part of a no-pest strip (dichlorvos) with the clothes in storage container. The smell of naphthalene may be difficult to remove from clothing. Dry clean clothing again before wearing to help remove any odor. No-pest strips may be difficult to find in stores. Cedar chips, although popular as an insect repellent, do not effectively deter carpet beetles. Get rid of or properly store remnants or scraps of wool, fur, fleece, and other material. Woolen garments and less expensive furs can be stored in a closet used for that purpose only. A no-pest strip hung in a closed closet will protect the garments for 3 to 4 months. One no-pest strip protects 1,000 square feet. Cut it into smaller pieces if the storage area is smaller. Do not use scissors or knives used to cut no-pest strips on food or food packaging. Clothes moths are well-known pests of fabrics in the home. Two species of clothes moths commonly infest woolens and other animal fibers. Both the webbing clothes moth and the casemaking clothes moth are similar in appearance. The adult moths are uniformly yellowish or buff in color and approximately 1/4-inch long. They have a fluttery flight and tend to avoid light. Fully grown larvae are 1/2-inch long and white with brownish-black heads. They spin a silken feeding tube or hard protective case in the fabrics on which they feed. The Indian meal moth, a common house-infesting moth, often is confused with the clothes moth. However, it does not attack clothing but rather is associated with dried food. Indian meal moth adults are darker on one half of the body. 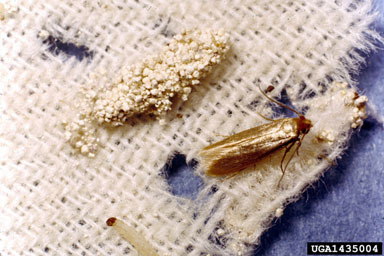 The adult clothes moth lays its soft, white eggs in the fabric it attacks. The eggs hatch into creamy-white larvae. The larval stage is the only feeding stage in the moth's life cycle. Approximately four generations per year occur under household conditions. Most clothes moth infestations in homes are carried in on carpeting, woolen goods, furniture, and other home furnishings. Used household items should be thoroughly sunned before being taken into the home. Winter clothing should be dry cleaned and stored in clothing cases or chests between cold weather use. In general, prevention measures for carpet beetles also will control clothes moths.